A mobile application to quickly diagnose sicknesses in developing countries. Page to view created visit, showing a suggested diagnosis given their symptoms. MedBot is a program created by Jacob Hughey, Brandon Adame Gachuc, and Nolan Scobie at HackDuke 2018. The application was created with the intention of bringing quick and affordable health screenings to developing countries, where diseases are rampant and health care is greatly lacking. 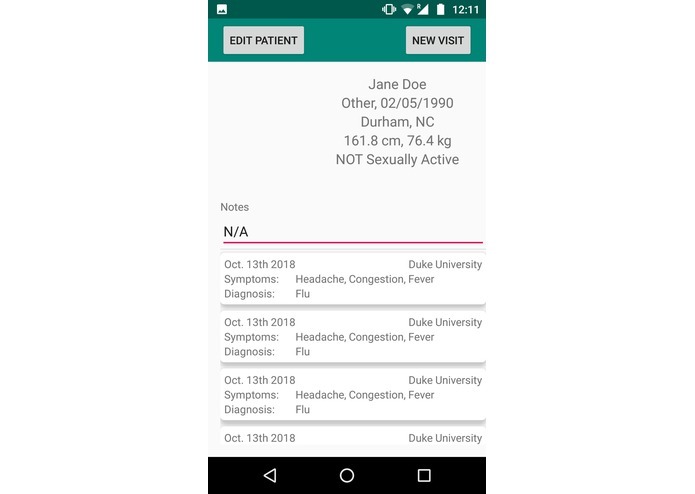 By allowing volunteers to administer a checkup, receiving a patient's information and symptoms, MedBot analyzes the data provided to provide a diagnosis. If a patient needs to be seen by a doctor, they are marked for a future visit. If they need medicine, this information is saved in a local database to be sent to a pharmacist when internet connectivity is available. 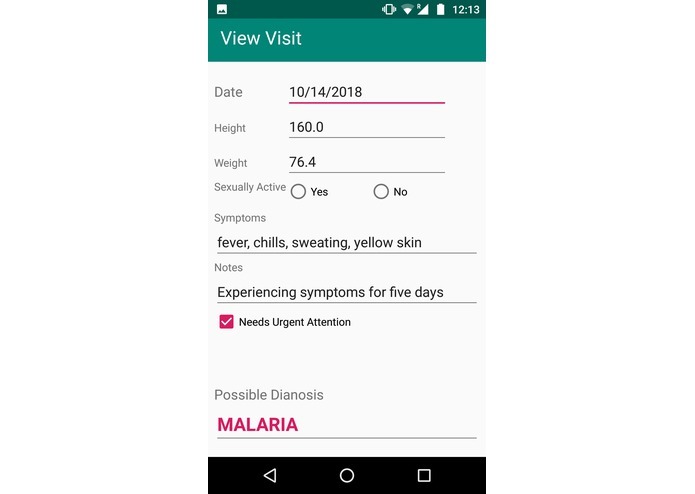 Since many developing countries have limited internet access, the app was created to be run on the client side, and only needs internet in order to place pharmaceutical orders and connect to a complete patient data set in the cloud. Of course, the greatest pitfall to such technology is that there is no way to ensure accuracy in diagnosing patients solely through such an application. We understand that such limitations exist, and have created the application to mark patients that are in need of medical attention to be seen by a doctor in order to accurately diagnose them, while still offering the opportunity of quick and cheap medical care to those with simpler illnesses. I scraped MayoClinic for a list of all conditions and symptoms, creating a database through SQLite. 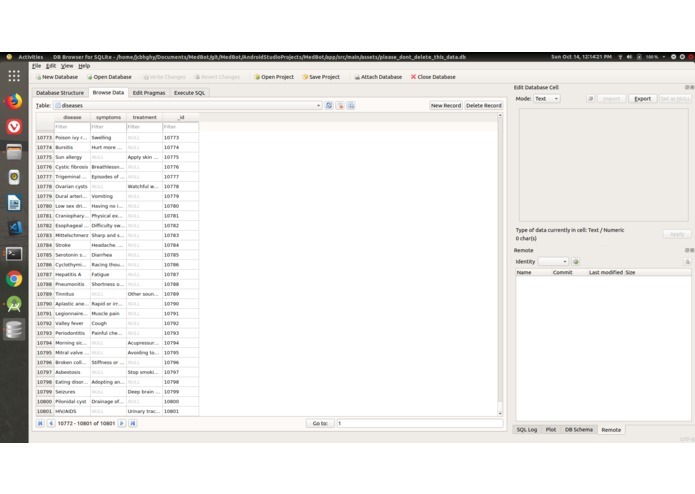 I worked to create queries to make the data accessible in Java, creating the basis for a connection between the backend and database. I developed the Android UI and business logic code for handling state transitions and CRUD operations on the front end.